Firstly, tell us about yourself! Where do you live, what sort of art do you make and how many children do you have? I am a multi-disciplinary collaborative artist crossing writing, drawing, sculpture, photography, installation, performance living in Hastings, East Sussex with my husband & daughter, who is now 9. I tend to flit from medium to medium and after a long time of focusing on writing, am now getting back into making. I’ve just started a new body of work using my journals as raw materials to create a series of sculptures. I explore ideas surrounding gender, motherhood, mental health and intersectional eco-feminism. I’ve also been collaborating with artist Clare Whistler since 2017 on elemental, a series of workshops for women, which are an experiential exploration of the elements through poetry, meditation and site-specific artworks. How do you continue to engage with your art practice alongside raising children? Do you have a dedicated studio space and routine, or do you work from home in between other things? I currently have the spare room as a small studio, but space is limited which is why I’d been focusing on writing until recently, as it takes up less space. Before my daughter was born, I had the naïve idea that I would be able to take her with me to the studio I was renting at the time, but the reality proved to be very different. Although I did rent a couple of different studios when she was younger, it became too expensive to keep them, as juggling motherhood and finding studio time was almost impossible early on. I now just squeeze in creative time at home when I can and when inspiration hits me. 'Journal Sculptures' work in progress. What does a typical day look like for you and how much time do you manage to carve out for your own work? It really varies – I just tend to fit work in when I can. It depends a lot on how I’m feeling too, as I have a diagnosis of bipolar disorder, which I manage without medication, so there are times when I’m unable to work at all and other times when I’m super-productive. Have you come up against specific challenges as an artist and mother? What were they and how have you navigated these challenges? My mental health has been the biggest challenge. A few months after my daughter started school, I had a complete nervous breakdown and had to hand over aGender, the art education charity I had just founded, which challenges gender stereotypes through creative media with young people, as well as leave my part-time teaching job. My art practice ground almost to a standstill and I was diagnosed with rapid cycling bipolar disorder. I used this to inform a few small projects during my recovery, which helped me maintain slivers of my identity as an artist, but this sense came & went all too easily. For the past three years I’ve been having intensive psychoanalytical psychotherapy, which has been key to understanding my condition as well as being the most important aspect of my recovery. I now have a part-time job as an artist’s studio assistant to help me financially, which is helping me regain some confidence and is also inspiring me to make work again by exploring different materials after focusing on writing for so long. What is the best piece of advice you have been given? 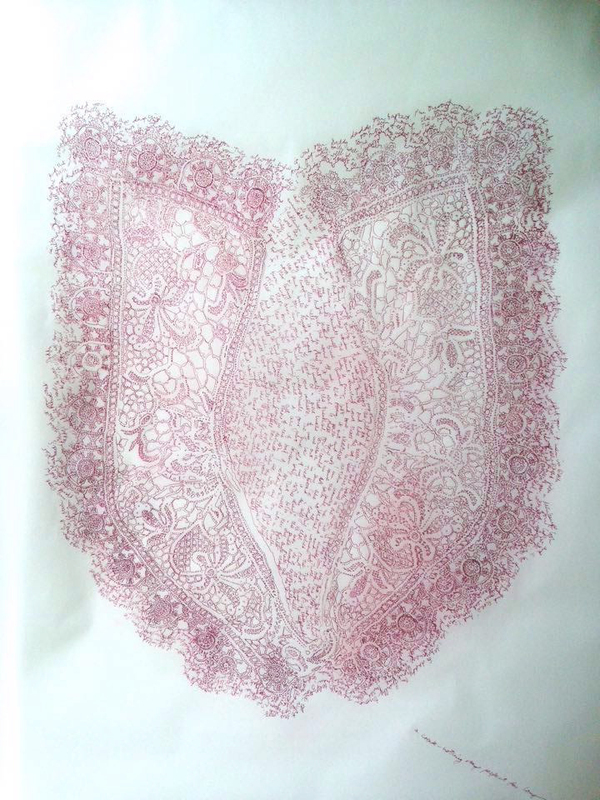 'Plath's Lace', drawing on tracing paper, 2015.
Who are your role models? Who or what inspires and encourages you? My favourite artists are Paula Rego, Louise Bourgeois, Ana Mendieta and I love the writing of Sylvia Plath. I am currently researching contemporary artists who are using their experience of motherhood as a key part of their work and have recently started the Artists Residency in Motherhood (ARiM) founded by Lenka Clayton and have formed a small group of local artists, who are also mothers, to encourage and positively critique each other’s work. I also attended Oxytocin: Birthing the World conference last year at RCA by the Procreate project, which covered themes of art, mental health and motherhood. How has the experience of motherhood impacted your practice on an emotional/intellectual level? Has it made you view yourself/your work differently? Are there things that influence your work now that you didn't think about pre-kids? I have a greater sense of mortality since having my daughter. As I struggle with suicidal thoughts on a regular basis, there are times when I have to work very hard to remember that there are things to live for. My daughter, husband and art practice all help me to do this. I frequently become paralysed with fear about climate change and worry about my daughter’s future. The recent heatwave around the world, with record temperatures in the UK and wildfires in Greece, Canada and the Arctic Circle are all direct evidence of the effects of human activity on the planet and I swing from hope to despair on a regular basis. This inevitably influences my work, focusing on the psychological impacts of climate change and how climate anxiety and solastaglia impact our mental health. If your child(ren) were asked “Tell me about your mother” what do you hope they would say? Are there particular things you are trying to show/teach them as an artist, a mother, a woman? She would probably say I get very grumpy! But I’d hope she’d say that she likes my work and is inspired by my drive to create despite the obstacles. My aim is to carve out a more consistent practice and connect with like-minded artists, in order to show her that women can be artists as well as mothers and the two are not mutually exclusive. She is very creative herself, and has ambitions to be either an artist, a photographer or a film director. What drives you to continue to create work? If I haven’t made anything for a while, I just start boiling over and I have to channel it into something creative, be it a piece of writing, visual art or a collaboration. It’s a creative need that is definitely therapeutic and helps keep me balanced. I’d like to share a poem I wrote earlier this year, which is an ode to the complex and often paradoxical experience of motherhood. You can read the full poem on my website (link below). 'Knitted Shreds', (shredded photographs, staples, knitting needles), 2012. For more information about our members, or to join visit our membership page.